Globe Switch - Everything you need to know about this wonderful app is right here! - All Chucked Up! You are Here >> Home >> Tech >> Globe Switch – Everything you need to know about this wonderful app is right here! It’s normal for us to be cautious and watchful of our consumed data because we don’t want to end up using more than necessary or going beyond our allotted budget. But up until now, it’s been quite difficult to look for an application that can accurately keep track of our mobile data usage. Globe realizes this need which is the very reason they have finally come up with an app that will not only keep our usage in check, but provide so much more than that. Globe Switch is an interactive sales channel, brought to you exclusively by Globe Telecom, that offers your favorite games, applications & Globe promos at the most affordable prices available. In addition, Globe Switch gives you full control over which applications are exposed to data charges. This helps prevent unwanted consumption of data by apps that you are not currently using, ultimately protecting your wallet from unexpected data charges. Through its data tracking capability, Globe Switch allows you to track your data usage on an hourly, daily and monthly basis, keeping you in constant control of your data consumption. Globe Switch will provide you with a permanent set of FREE applications that will always be available to explore at zero cost. You will have exclusive access to the latest discounts on your favorite games and applications through the weekly updated “Hot Deals” tab. 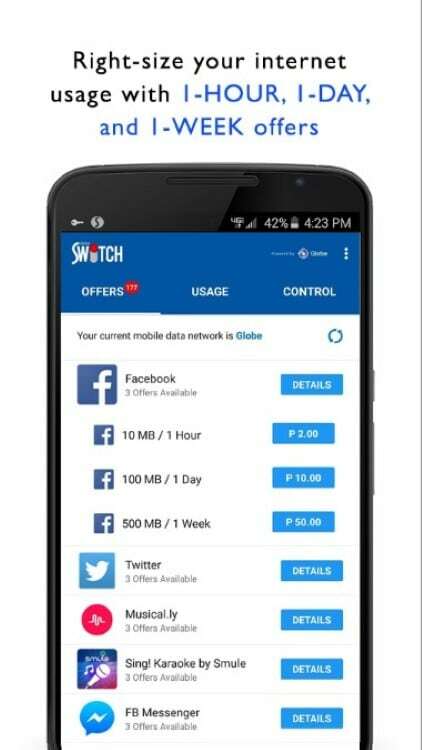 Globe Switch will also give you the option to bundle applications for 1 standard price, giving you more flexibility in how you consume your data. How do I download the Globe Switch application? You can download the latest version of Globe Switch directly from the Google Play Store. If I have an iPhone, will I be able to download Globe Switch? At the moment, Globe Switch is only available on Android OS. Do I have to be a Globe subscriber to download Globe Switch? The Globe Switch application is available to download for any subscriber. However, to avail of any standard offers, discounts, bundles or Globe promos available on Globe Switch, you must be either a Globe or Touch Mobile subscriber. With Globe Switch on, do I still need mobile data or a Wifi connection? Yes, you would still need mobile data or a Wifi connection to enjoy your favorite games, applications and promos. Please note that Globe Switch does not impact your mobile data or Wifi connection. How is DataEye different from Globe Switch? Although both applications have similar data managing controls, Globe Switch will have a more expansive list of affordable games, applications & Globe promos available within its application. If I downloaded DataEye already, can I still download Globe Switch? Of course! You will be able to easily download Switch from the Google Play Store or even within DataEye by simply clicking on Switch application found in the “available” tab. What are all of the tabs? The 3 tabs found at the top of the screen — Usage, Control, Offers — open to pages that allow you to monitor your mobile data usage, control which of your applications are exposed to data charges, and browse through our available offers, respectively. What about all the tabs listed under the offers page? The offers page provides you with the full list of games, applications & Globe promos available for purchase and monitoring. The Activated tab includes all offers which you have activated or purchased. 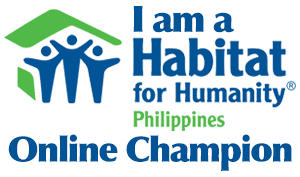 The Available tab includes all games, applications & promos that are available for purchase at any time. In addition, the tab has a set of applications permanently FREE for you to openly use and explore at zero cost. The Recently Expired tab will automatically include the offers that you have purchased and exhausted, either through the time limit or data usage limit. How do I activate an offer? To activate an offer, please ensure the Switch application is “on” within the controls tab, and, if not for free, please ensure you have ample mobile load to make your selected purchase. Then under the Available tab, please click the offer you would like to activate. When accepting the offer, on the following screen, please select “accept” at the bottom of the screen. What happens if I activate an offer of an application that I do not currently have? 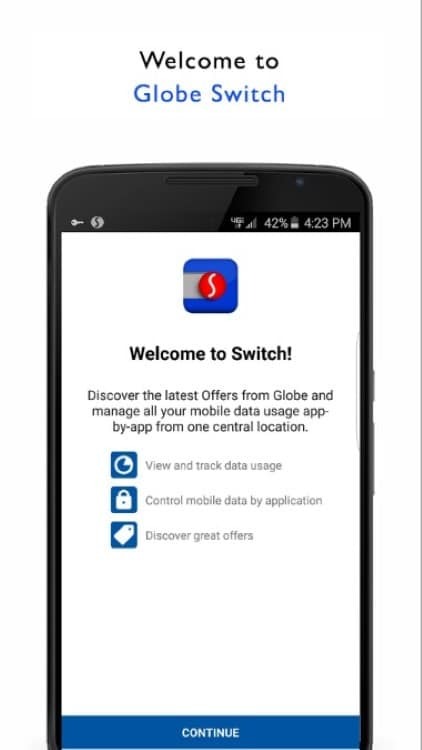 If you activate an offer of an application that you do not currently have, Globe Switch will automatically transfer you to the Google Play Store where you download the application directly. Is the data usage for downloading an application for free? The download of a mobile application is not data free. It is recommended that you download the application while on Wifi. What happens if I activate an offer that I’ve blocked under the Control tab? 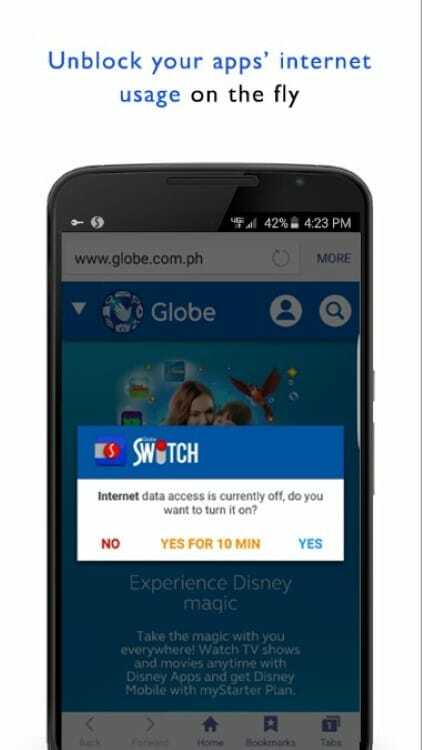 You will immediately receive a notification from Globe Switch asking you whether you want to remove the application from being blocked? If you select “yes”, it will automatically become unblocked for your use. If an offer I availed is moved to the Recently Expired tab, does that mean I can’t use it again? You can avail of any offer as many times as you want. Just simply find the offer listed in the Available tab and purchase again. The Recently Expired tab is there for you to reference which offers you have exhausted. How do I see my offer’s usage and when it is expiring? To see an offer’s time and data usage limit, you can find these details below the selected offer under the Activated tab. The details will provide how many day(s) remaining and how much data is available. How can I extend the validity of an offer I availed on Globe Switch? You can purchase the same offer that is found in the Available tab while in use. Once you exhaust the limit of your selected offer, either through time limit or data usage limit, you will automatically be sent a notification within Globe Switch that will provide you with both the same offer and a GoSurf promo for your choosing. 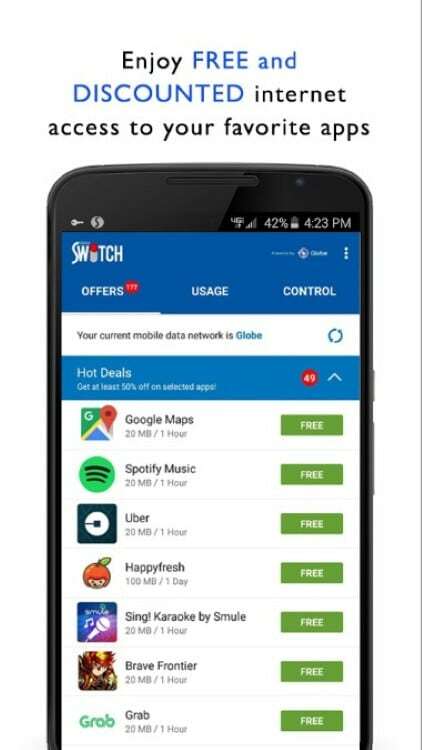 When I first downloaded Globe Switch, I noticed that almost all the offers under the offer tab are listed as FREE, does that mean all the offers in Globe Switch are for Free? All games and applications FREE on a one-time trial basis for first-time downloaders of the Globe Switch application. Once you’ve reached the limit with a free one-time trial offer, the offer will be updated with its standard price in future use. Will any of these offers become unavailable for purchase at a certain point? All offers under the available tab will be permanently available for you to purchase. Keep a lookout as Globe will continue to add more offers available for purchase going forward. However, please note that each individual “hot deal” will only be available on a temporary basis. How do I know which offers are free on a one-time trial basis? How can I create a bundle? Within the Available tab, the bundle options will be defined by the blue number pad icon on the left side of the screen coupled with the corresponding bundle details (Ex: 2 Apps for P15). Once selected, on the following page, you will be able to select 2 applications at a single validity for a standard price. 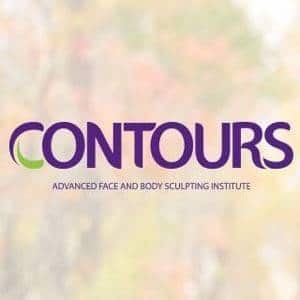 How do I know when an application is on discount? If you are using Globe Switch and a discount becomes available, you will automatically receive a “Hot Deals” notification that will allow you to avail of the discounted application. Be sure to click on the “Hot Deals” that you like, as they will only be available on a temporary basis. What if I exhausted an application on Globe Switch that is still currently available on my GoSurf plan? 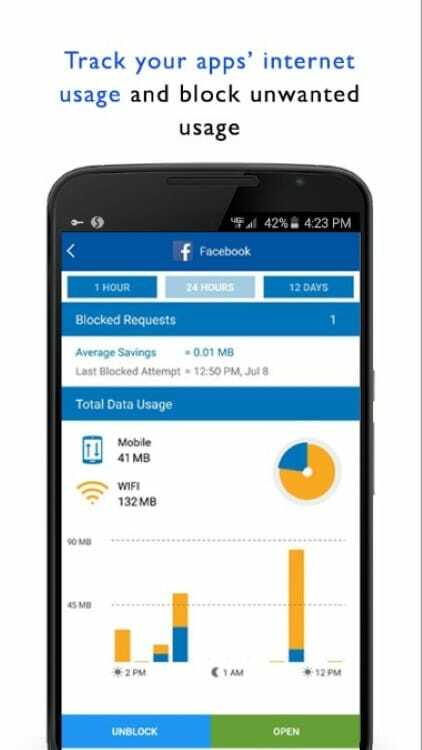 Globe Switch will be able to monitor your data usage within its application. If you exhausted an application within Globe Switch, it will notify you only based on your data consumption with Switch. If you wish to use the application from your GoSurf plan, just make sure you unblock it within Switch, and you’ll be able to freely use it outside of the application. That’s it, folks. I hope these answers have helped you understand Globe Switch all the more. Thank you, Globe, for always looking after your loyal subscribers! Download Globe Switch here and make your mobile experience a more wonderful one. Cheers! ‹ AirAsia wins at the Skytrax Awards for the 8th straight year! › Nurture Wellness Village – One unforgettable glamping staycation! It can use for tm user or not? I am using ZTE mobile wifi of globe and I use ZTE link to access messages and other stuffs on my globe sim in my pocket wifi. Can I register to the app’s promos without inserting my sim to my phone? How about gou activate a promo using adroid phone and then u transfer the sim card to iphone, are you still can access or use the offer u activated without using gswitch? I hope someone can help me with my inquiry on Switch’s “Spin to Win”. I was not allowed to Spin to Win because I had zero load left. But even after reloading P10. I still do not have any luck . Help! !